The New York Times' critic Ben Ratliff begins Every Song Ever: Twenty Ways to Listen in an Age of Musical Plenty with a reflection on the state of modern listening: "We are listening in the time of the cloud... Now we can hear nearly everything, almost whenever, almost wherever, often for free... But once we hear it, how can we allow ourselves to make sense of it?" Ratliff's question is the central challenge of the modern listening experience. Though the rise of MP3 technology gave music fans unprecedented access to music, the newfound abundance turned many into data archivists. Many listeners were faced with the new problem of hoarding vastly more music than they could listen to. Though music gradually evolved to cloud-based listening, which eliminated the need for acquiring files altogether, the daunting manual process of organizing our collections remained. Shuffling music provides one solution. During the days of multi-CD players, only several CDs worth of tracks were put into the jumble. In the beginning of 2005, Apple embraced randomness with the release of its iPod Shuffle, increasing the selection pool to hundreds, if not thousands, of tracks. Today, cloud-based shuffling, found on all major platforms including Spotify, Apple Music, and Tidal, opens the floodgates to countless tracks beyond our collections. By modest estimates, we've been rearranging music for over a decade, a practice that, at this point, is here to stay. Shuffling helps cull the multitude, rediscover the forgotten, or unearth new artistic gems inferred by our preferences. In "Listening in Shuffle Mode", Marta García Quiñones mentions another aspect of the technology, that it "is a user control that paradoxically involves a renunciation of control on the part of the user." Indeed, randomizing based on an artist, song, album, genre, or mood gives the majority of playlist responsibility to a piece of software or machine algorithm, alleviating the need for choice. But often we welcome this serendipity. In a study analyzing "shuffle experience", researchers found the subjects experienced "unexpected connections or enlightened discoveries...Thus from a user-experience perspective, serendipity can be seen as the meaningful experience of chance encounters." But is shuffling so ingrained in our habits that we don't realize how it changes our listening experience? And does shuffling alter the ways in which we understand music? Quiñones has more to say on the subject. "One of the most basic and important functions of the shuffle mode – one that it is rarely mentioned by users – consists in reminding the listener periodically that she is listening." While shuffling, a current track's conclusion produces a sense of expectation for what's next, which isn't present during a traditional continuous album listen. Shuffling often uses tracks as its fundamental quantity, diminishing the artistic unity of the album. Quiñones writes, "The random function has acquired new meaning in digital music players, as now it usually involves the chance reproduction of a large number of songs, as well as the obscuration of their link with...albums." Eluvium grapples with these issues of postmodern listening on his latest release, Shuffle Drones. An accomplished veteran of ambient music, Eluvium's work has earned him a distinguished spot on Pitchfork's "50 Best Ambient Albums of All Time". Shuffle Drones is a collection of two dozen orchestral snippets clocking in at roughly 30 seconds each, but its novelty results from how it is meant to be experienced – in shuffle mode. Eluvium instructs listeners to set song crossfading to zero seconds in the player preferences before beginning. Each track begins and ends with the same lovely string sound, creating a seamless experience as tracks are randomized for as long as the listener chooses. The organic tones are placid and unobtrusive, a gentle flow that evokes a secluded forest stream. The album consists of ephemeral moments, like a short piano phrase or an utterance of swelling strings, but the effect remains unique – and yes, serendipitous. Unlike much of ambient music, which can be enjoyed within a recessed listening environment, Drones commands attention. As Quiñones remarks, Eluvium makes us aware of listening, while departs from most shuffled music by remaining tethered to the album as its basic unit. The brief length of the snippets coincide with a time that listeners are already accustomed to: the 30-second advertisement. Now mostly experienced online, an ad's concrete duration contains an internal rhythm that can be anticipated and internalized even after a few minutes. Viewers become aware of an ad's conclusion or the main program's return, not unlike a structural understanding of a pop song. Eluvium's 30-second snippets function in a similar way. Listen for long enough and you'll hear the breaks, providing a sense of temporal comfort that provides more certainty than usual shuffle listening. While Drones relies on a music player's random number generator, the music isn't generative like Brian Eno's Reflection, an iterative music system released as an app this year. Comparisons to Brian Eno, who secures a staggering five albums on Pitchfork's 50 Best Ambient Albums, seem inevitable. Especially recently, the godfather of ambient has embraced generative systems, deemphasizing his role in the interest of self-propagating sets of conditions that let the machines play for themselves. Eluvium meets Eno halfway with his set of "micro-songs" and constrains them to their short loops, though the music is still secondary to its listening method. Shuffle Drones creates a sum that is greater than its parts and will please ambient fans and newcomers alike. The album is foremost a beautiful collection of orchestral arrangements that comes into dialogue with its technological subversion. By pointing out how we listen, Eluvium has paradoxically created a work that reaches beyond its inherent track structure and finds a new use for a feature that comes standard on any modern listening platform. 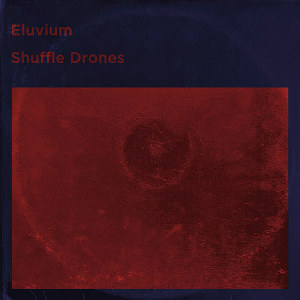 Shuffle Drones is less a traditional album and more an elegant set of infinite possibilities.